Eabametoong First Nation is over-joyed to announce that, through the hard work of our Garden Working Group members and support of the EFN Chief and Council, we have secured a large commitment to continue investing in our community garden! We have an additional $649,000 in funding from the Ontario Trillium Foundation to further develop our 5-acre farm (located by Reserve Lake, close to Thomas Bridge). We are proud of our team members who have helped ensure that this project will be a success. 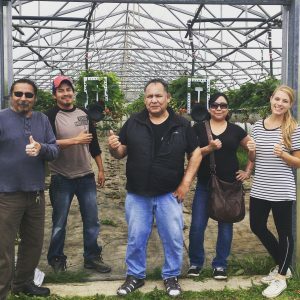 Over the next three years, we will be growing fresh food for the community, offering jobs and skills training, and creating a local farm business – all while honouring traditional wisdom from the Elders. Stay tuned (via the radio, newsletters, local cable, EFN website, and Facebook) for updates on the farm and local celebrations, the upcoming greenhouse study, and how to get involved! A heartfelt recognition and thank-you to goes out to: all of our workers, volunteers, Working Group members, Chief & Council, Band Management & Finance team, Health & Social Services, Ontario Works, community members, private partners, our training partner Covenant North, The University of Guelph, The Nishnawbe-Aski Development Fund, Indigenous and Northern Affairs Canada, and the Ontario Trillium Foundation!